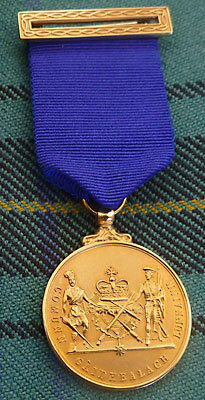 The Gold Medal by Faye Henderson at the the Argyllshire Gathering in 2010. The following is a list of Piobaireachd Gold Medalists at the Argyllshire Gathering (held in Oban, Scotland), and the Northern Meeting (traditionally held in Inverness, Scotland). These games were founded in the late 19th century and are the most prestigious bagpiping venues in the world. Each year, the Argyllshire Gathering awards the first of two Gold Medals for Piobaireachd under the auspices of the Highland Society of London—the second of the Gold Medals being awarded by the Northern Meeting later in the year. An asterisk ("*")after a name indicates a double gold medalist, that is, the individual won both the Argyllshire Gathering and Northern Meeting medals in the same year. This has only been accomplished eight times in well over 100 years, making it quite a rare event indeed! 1949 - PS R. MacKay, CH. 1990 - Sgt. Brian Donaldson, Scots Guards. Venue changed from Inverness to Aviemore in 2005. Venue returned to Inverness in 2008. You may also be interested in winners of the Gold Medal (Canada). This page last updated Sunday, December 10, 2017. Page first created in November 6, 2006.